This pet drops from Rukdug, a rare elite that can be found in the non-instanced version of Highmaul in western Nagrand (Draenor). 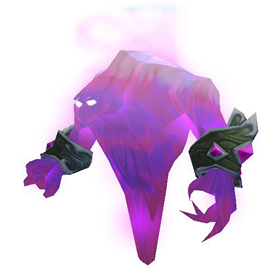 This pet has potential applications in PVP. 325 speed works well with 'Evanescence', blocking attacks for 2 rounds against pets with lower speed. 'Evanescence' also works well with 'Surge of Power' and will protect you for 1 round during recharge phase. 1339 HP is low, but works well with the Magic racial. How do you get to these mobs? Aren't they behing a locked gate? These 3 new pets have very similar moves except for the 3rd tier talents. You have your pick of a barrier, dodge, or an AOE. Stacking Amplify Magic and Arcane Storm is a fun team damage path to take. I think Brightpaw is the only new pet that can pull the most damage with Arcane Storm (150% Extra) by using Prowl. Energized by the ogre-mages of Highmaul, this mana-hungry creature will drain you dry before you know it.